A slew of new details about Red Dead Redemption 2 have come to light, revealed not by way of press release or fancy-schmancy trailer, but by the fine print on the Red Dead Redemption 2 PS4 Pro bundle. Fan site Rockstar Intel has scanned this teensy tiny text and found three major takeaways: one, the game's install size, two, the number of players supported in Red Dead Online, and three, the length of time PS4 players get to enjoy timed exclusivity on post-launch content. Let's break it all down. We've known since 2016 that PlayStation would be getting timed exclusivity on Red Dead Redemption 2 post-launch goodies, but the specific window of 30 days is new. "What kind of goodies," you may be wondering. The PlayStation Blog post that first announced the partnership between Sony and Rockstar only refers to it as "online content," which could mean content that's bought online, ie. story DLC, or whatever you'll end up getting access to when you play Red Dead Online. And you better believe there's some tantalizing new details about that as well. According to the fine print, Red Dead Redemption 2 will let you play with between one and 31 other players. 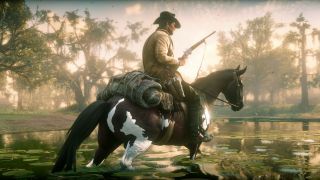 We still don't know how that will be structured or if it'll be split in some fashion (perhaps there's a co-op mode as well as a GTA Online-like shared world), but hey, at least now you have a rough idea of how many other cutthroats, bandits, and outlaws you'll be able to play with when Red Dead Online launches as an open beta in November. Catch up on characters, environments, activities and more in our roundup of everything you need to know about Red Dead Redemption 2.